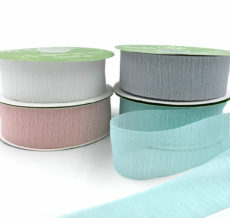 May Arts carries stitched ribbons in a wide variety of sizes & styles. Available in satin, sheer, grosgrain, checks, stripes & more. Need a ribbon for an invitation, our stitched satin creates an elegant look. Great for gift wrapping, scrapbooking, gift baskets, or decorating for any occasion!